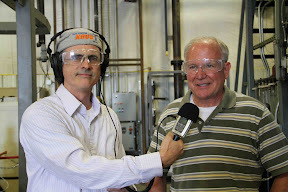 This week on Thursday, August 11th at 7pm on solar-powered www.KRUUfm.com, the "Dream Green" series visits the Biomass Energy Conversion Facility in Nevada, Iowa to speak with its executive director Norm Olson, PE. He takes co-hosts Stuart Tanner and James Moore on a walking tour of the BECON facility which serves as a bridge for bringing applied technologies from research to the marketplace. Mr. Olson has been a project manager for the Iowa Energy Center since 1992. He developed the concept and led the implementation of the Energy Center’s two research facilities: the Energy Resource Station in Ankeny, Iowa and the BECON Facility in Nevada, Iowa. Mr. Olson also coordinates the Energy Center’s biomass to chemicals and energy portfolio of projects. Prior to joining the Energy Center, Mr. Olson was the energy engineering manager at the University of Iowa. Mr. Olson is a registered professional engineer. Also on the docket is a walking tour with Iowa State University Extension water resources engineer Matt Helmers, who take Tanner and Moore to a prairie research field outside of Boone, Iowa for a discussion on switch grass, prairie grass, crop rotation, soil erosion and much more. An assistant professor in the ISU Department of Agricultural and Biosystems Engineering, Helmers ia an Iowa native from Sibley where his family still farms. He received his Ph.D. from the University of Nebraska-Lincoln. His research focus is on water quality and hydrologic effects of agricultural best management practices, including strategic placement and design of buffer systems and methods to improve water quality in tile drained landscapes. His extension focus is on education of producers and other stakeholders on the impacts of agricultural practices on water quality and methods to minimize these impacts.